Hot Flashes, Girl Talk, and Hat Tricks are available through Samuel French. Please contact Dori Appel directly to make arrangements for performance of her other plays and monologues. Please get in touch with me about this! Is it people and the animals who love them? Or animals and the people who love them? Either way, "Far from the Zoo" is about people and animals. As such, it is funny, poignant and, for animal lovers, is bound to spark a memory or two about their own pets. he play is by Dori Appel, the published Ashland author who has won three Oregon Book Awards for playwrighting. She put the scenes together as a benefit for the Rogue Valley's five shelters. "We all do have significant relationships with the animals and the people in our lives and all the pieces are really about people — people with animals. And my intention and hope is that it resonates with people," Appel said just after the play premiered in Medford at the Randall Theatre last weekend. 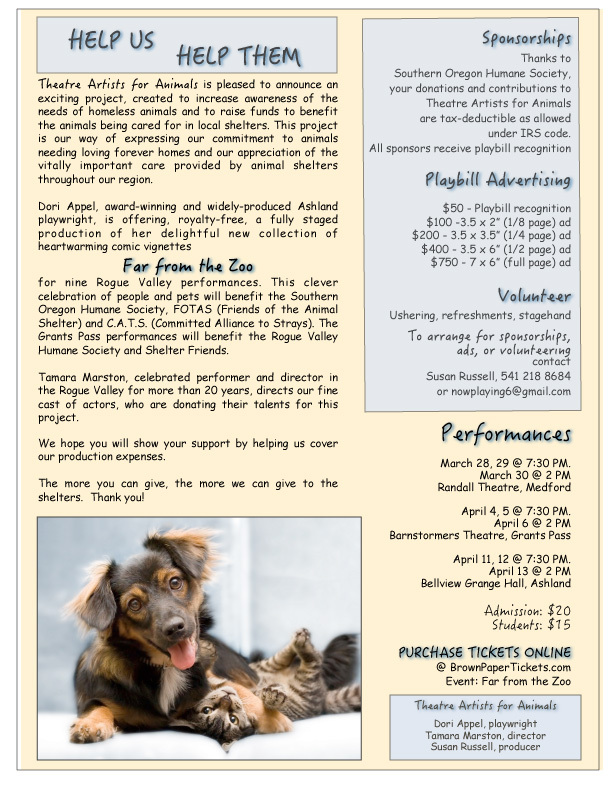 The Grants Pass run is this weekend at the Barnstormers Theatre; see box for details. With help from Susan Russell of Grants Pass as producer and director Tamara Marston, a veteran of Grants Pass stages as an actor, Appel gathered a new group, Theatre Artists for Animals. And then they started contacting some excellent actors, including Brandy Carson, a true veteran of the valley's theater community, Ronda Bagley, Joe Caron, Cory Davison, David Dials and Jacqueline Sundin. Bagley and Sundin are well known to Barnstormers Theatre fans. Appel was excited to have actors from around the valley. "I really want to say something about this amazing cast. They were excellent and marvelous. What actors add to a written piece is just indescribable." The scenes, 14 of them, were written over several years. "I have written a number of plays, probably eight or more of a traditional structure where it's the same characters and situation and plot. But I've probably written more even of this structure, and so it's a natural way for me to work. I like it. I like the idea of getting it out there fast. And I like the variety that this kind of structure gives, a lot of characters and situations and plots and tone. Some are plain funny and some are more sweet," Appel said. "Three of the pieces are having a second career. 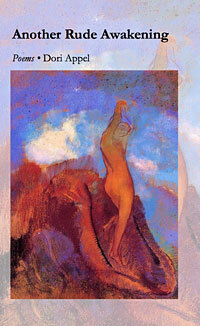 They started out as poems," Appel noted. Two began as poems about girls and horses that Appel transformed into very short monologues for Sundin. The final piece of the show is about Appel's adoption of Maggie, a dog who just barely survived abuse with her puppies and lived to be 13 in Appel's happy home. Appel got many of her ideas from experience and from the news. For instance, one of the more entertaining pieces is about Genghis, a cat who finds himself stuck when he dives into the garbage disposal for some salmon skin. Where would you turn to get your cat unstuck? That was an actual situation she read about, although she added her own quirky solution to the stuck cat problem. 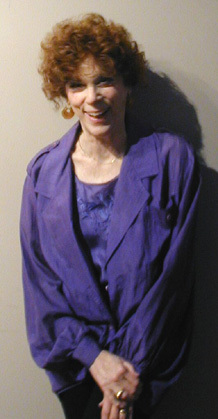 Appel lifted a one-woman scene that Carson makes the most of called "Junkyard Dog" from a previous play, thanks to permission from her publisher. The charming scene is about a tough old junkyard owner who is convinced to get a security dog - who turns out to be more than a big bark. The scenes get quirkier than that, such as the opening vignette called "Monkeyshines" about a grown man (Davison) who was raised by his scientist parents with a chimp brother and a scene between two extinct animals and Mr. and Mrs. Noah, "The Last Dodo and the Last Wooly Mammoth" with Bagley and Carson. 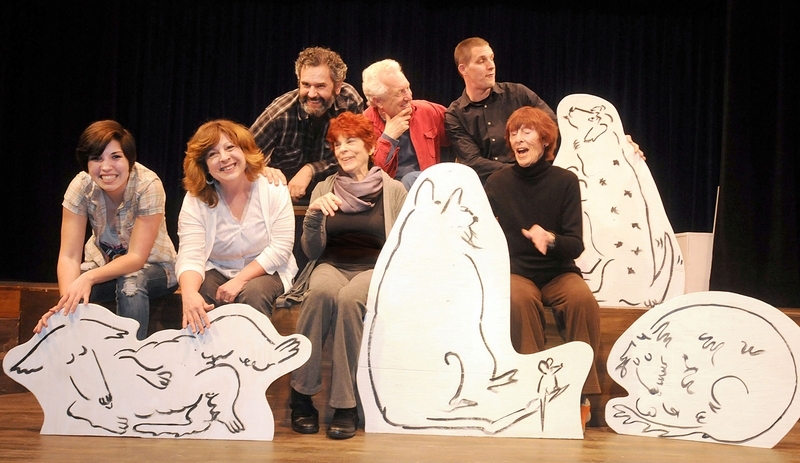 Having a menagerie of real animals off and on stage seemed too nuts to consider, but they lucked out in tapping Mari Gayatri Stein, a book illustrator and artist Appel worked with previously. Stein created black-and-white drawings of dogs, cats and other critters that were used on stage and on the program cover. Mostly, the excellent actors conjure their critters out of the air and the audience's imagination - thanks to some excellent description. Appel said the project was ambitious from the start â€” an all-volunteer cast for 14 scenes and in three venues to benefit five shelters around the valley. The scheduling alone must have been an organizational triumph. "It's just as well that none of us realized what an enormous project it would be ahead of time," Appel said with a smile in her voice. She'd helped put together other shelter benefits, as an active supporter of the shelters and the many volunteers who keep them running. But they were more variety shows, she said â€” not something like this and not across the valley. 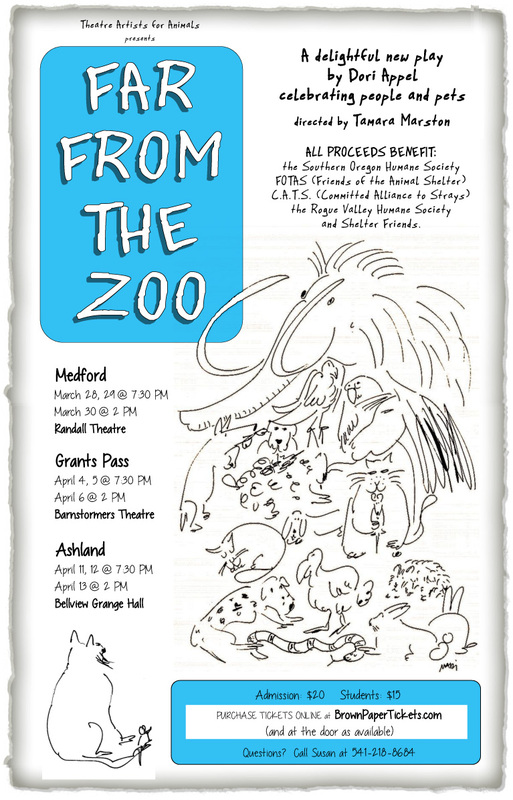 After all the work of putting it together, she's offering "Far From the Zoo" to humane societies and shelter non-profits anywhere who'd like to use it as a fundraiser. "I'm hoping it will have a future of benefitting shelters," she said. "Royalty free." Dori Appel is the author of 18 full length plays, and many one-acts, shorts and monologues. Her plays have been produced throughout the United States, as well as internationally, and two full-length plays, When God Came to Babylon and I'd Know You Anywhere, have been translated into Bulgarian. Her collection of poems, Another Rude Awakening, was published in 2008 by Cherry Grove Collections, and her poetry has also been featured in dozens of magazines and several well known anthologies. These include When I Am an Old Woman I Shall Wear Purple and The Best is Yet to Be, the audio recording of which was a 1997 Grammy finalist.